Government Of Punjab Safe Cities Authorities Lahore Punjab. • Age limit: for males (21-25) years and for females (21-28) years on the last date of advertisement. • Typing speed 30 wpm. • Experience of Police Department. IT Projects or Call Center would be advantageous. Note: Out of total positions, 29 positions are reserved for Minorities quota and 11 positions are reserved for Disabled quota. • The selected candidates will have to furnish Surety Bond to serve in the authority for two years after completion of training. • PSCA is an Equal Opportunity Employer, women, minorities and persons with special needs are encouraged to apply. • Authority has the right to accept/reject or cancel any application or recruitment process at any stage. • In the case of exigency number of vacancies may be increased or decreased at any time without any notice. • In the case of final selection, HEC verified Degree/Transcript will be required. • All qualifications must be from a Government / HEC recognized institution and in the discipline approved by Government /HEC. • PSCA provides Pick and Drop facility only at selected points. • Result awaiting candidates are not eligible to apply. • Subsequent tests and interviews may be conducted by the Authority. • The selected officers will be responsible to comply with PSCA Service Regulations and Punjab Essential (Maintenance) Service Act 1958. • Download the application form, and the deposit slips from the NTS website, www.nts.org.pk. Pay the prescribed fee of Rs.500/- in any bank of the countrywide online branches of AU, Meezan bank or HI31, and fill up the application form properly. 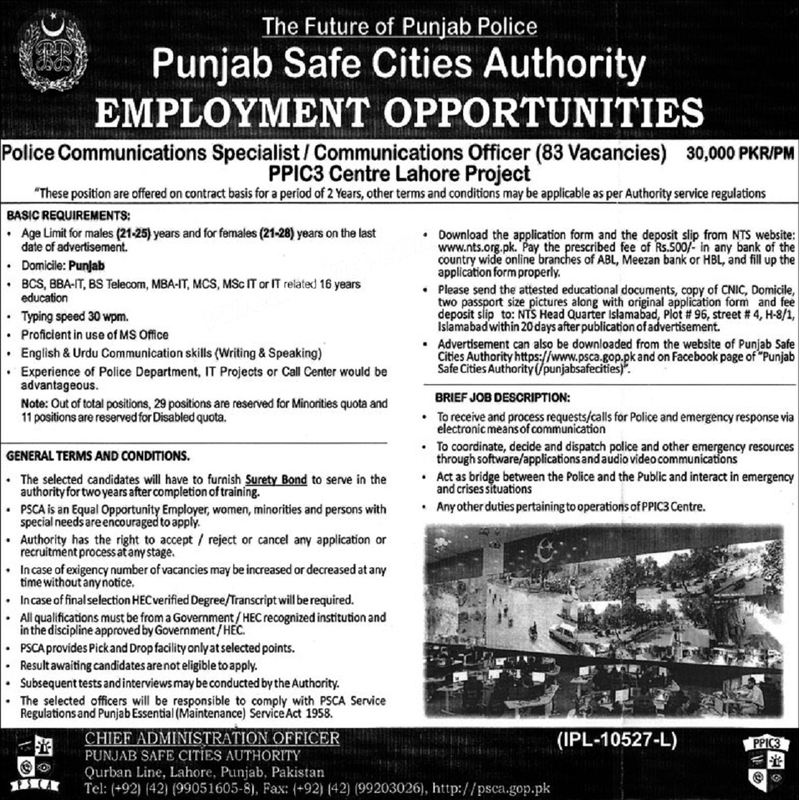 • Advertisement can also be downloaded from the website of Punjab Safe Cities Authority https://www.psca.gop.pk. Qurban Line, Lahore, Punjab, Pakistan.